I often talk about the “feel” of a restaurant and it’s importance. Obviously there are many aspects that contribute to the sensation you experience when walking in the door of an eatery: the lighting, the sounds, the design and how you are initially treated. I believe, however, that the feel goes far beyond what we frequently call ambience, and it is just as important as the most common components we use to judge restaurants: food, service, wine list, and price. Hotels and resorts also have a feel to them. I was fortunate to recently experience La Quinta Resort & Club in La Quinta, CA, 20 miles east of Palm Springs. As I was walking to dinner at Morgan’s in the Desert (La Quinta’s signature restaurant), I stopped to take in the beautifully manicured grounds and the majestic scenery, which included the stunning shadows and colors of a sunset on the nearby Santa Rosa Mountains. 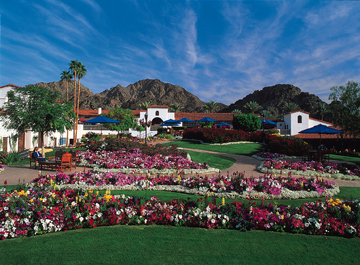 La Quinta is a special place and it simply does not get much better than this historic resort. Many, many factors go into the allure of this property, but in the hospitality business it eventually all comes down to the staff. At La Quinta Resort & Club the service is superb. ~ by Thomas on May 2, 2010.